(Galerie Rudolf Zwirner, Cologne); sold 1977 to Robert and Jane Meyerhoff, Phoenix, Maryland; gift 1996 to NGA. Provenance from The Robert and Jane Meyerhoff Collection 1945 to 1995, Exh. cat., National Gallery of Art, Washington, D.C., 1996: 239. 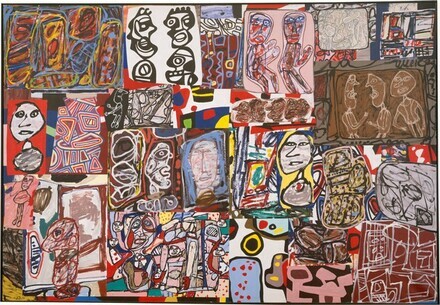 Jean Dubuffet: Théâtres de Mémoires, Galerie Rudolf Zwirner, Cologne, 1977. Selections from the Robert and Jane Meyerhoff Collection, Baltimore Museum of Art, 1978. The Robert and Jane Meyerhoff Collection: 1945 to 1995, National Gallery of Art, Washington, D.C., 1996, no. 25, color repro. The Robert and Jane Meyerhoff Collection: Selected Works, National Gallery of Art, Washington, D.C., 2009-2010, pl. 24. The Robert and Jane Meyerhoff Collection: 1945 to 1995. Exh. cat. National Gallery of Art, Washington, 1996: no. 25.